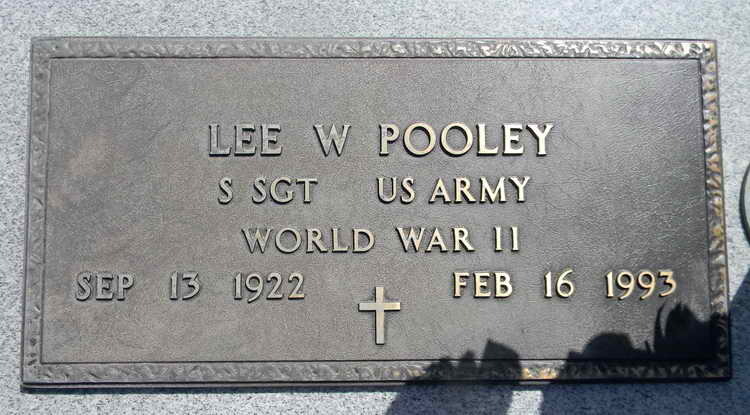 Grave marker for Lee W. Pooley in Section A, Row 18 of the Memory Gardens, Victoria (Victoria county), Texas. Lee enlisted in the Army at Abilene, TX on 20 October 1942.and was assigned to Headquarters Company, 2nd Battalion 508th PIR. On 5 March 1943 Pvt Pooley was declared a qualified parachutist. after completing the requite five jumps from an aircraft in flight. Pfc Pooley was appointed to the grade of Corporal on 7 March 1944 and then to Sergeant on 21 July 1944. Sgt Pooley was transferred to Service Company on 3 April 1945. His military awards include the Bronze Service Arrowhead device awarded for participation in Normandy assault.